Cardinals fans are reacting strongly to today's news of his departure for Anaheim, leading to surreal images like guards surrounding the statue of him outside his St. Louis restaurant. 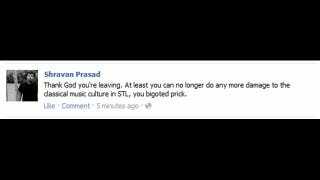 But one group in St. Louis is happy to see Pujols leave: lovers of classical music. The reason? Pujols was instrumental in raising funds for the takeover of KFUO, the Gateway City's only classical music station, and changing its format to Christian programming. The takeover led to a bitter dispute, complete with FCC disputes from the arts community which found its fundraising opportunities demolished after the format change. Thus reactions like the above (posted to, but since deleted from, the Albert Pujols Facebook fan page). Cardinals fans looking for reasons other than abandonment to hate their departed hero may discover a love for classical music they never knew they had—but they'll have to do it on iTunes.